Dr. Michelle Mudge-Riley trained as a physician but realized early in her career that wanted to transition into non-clinical medicine. In doing so learned lessons that are not usually taught to physicians. In the process has become a successful serial entrepreneur her current company, Physicians Helping Physicians serves physicians who are interested in figuring out how to make their career work for them. The community is unique because it’s not a “cookie cutter” approach to career transition or strategy. Every doctor is different and is coming from a different place. Some are 1-2 years or more out of residency and others have been in private practice for 10 years or more before finding this community. It’s been our experience that 80-90% of the time, physicians who work with this community will have a clear focus and career direction within 6-8 months. Most doctors have been struggling with this on their own for years, if not decades. In this episode, Michelle teaches us the importance of networking for career advancement. In April 2019, I will hold the first Physicians Helping Physicians celebration meeting. I’ve been coaching for over 10 years and I have only met a fraction of the people I’ve worked with. Most, if not all our work has been via phone or Skype. For those of you I haven’t yet worked with, this is an opportunity to get your non-clinical career or side-gig started – or grow it. On April 6-7th, 2019, I’m having a meeting/conference to celebrate you, meet you, and to talk about non-clinical careers and side gigs. I’m springing for food and drinks (over $10K!) and have negotiated a block of discount hotel rooms with an airport shuttle in Austin, Texas. In keeping with the theme of non-traditional careers, this will be a non-traditional meeting. I’ve already had 15 people who have successfully transitioned to a non-clinical career commit to coming to help mentor you. There will be sessions, workshops, networking, and plenty of fun! I will personally guarantee you an updated resume, elevator pitch, and action plan. I’m hoping for media training, expert witness training and companies with actual jobs who will be available to talk with you. The best part? The registration fee is up to you! Yep, I’m keeping with the non-traditional theme. I only ask that you consider a donation of $200-$500 to help with the costs. IF there is money left over, it will go towards next year’s celebration to make it even bigger and better! [3:49] Dr. Mudge-Riley Discusses transitioning out of medicine early in her career. [5:12] Networking is not a skill learned by doctors. It helped her transition out of medicine. [7;21] – Recommend working while in school to learn skills about the world and people. Networking is not about selling, it is about adding value to people’s lives. And in turn, that motivates them to want to help you. [12:19] – And you may not even get another conversation with this person, because they’re going to not want to talk to you. And they’ll think that you’re going to be asking them for a job. So by really focusing on what’s the other person interested in? [14:19] – And you may not even get another conversation with this person, because they’re going to not want to talk to you. And they’ll think that you’re going to be asking them for a job. So by really focusing on what’s the other person interested in? [16;32] So networking is a little bit harder. It’s not just an easy, call a recruiter, have them feed you jobs, take the job, they give you boom, you’re done. [23;11] – networking was probably twice as hard for me, because I’m an introvert, and it’s scary for me to reach out to other people. [26;03 – Today, social media is an interesting beast, it is very overwhelming… But the great part about social media is that it can introduce you to people that you never would have otherwise met. [29;08] – First, I would do a little bit of research is easy for us doctors… So once you identify what your options are, then you can start to see if there’s anyone there at any of those clinics or hospitals or organizations that you may know…find someone that is an alumnus of your medical school, or your residency or college or that your brother’s sister knows, or somehow you have a connection with this person…reach out to them and and just let them know that you’re considering moving to that area? And do they have any advice? Or how do they like it, you would not ask for a job at that point. [31;32] – Here’s the really beautiful part about it, you may find out something that you would never have found out about. [32:31] – So if you don’t have those coaching, those mentors that help that upward trajectory, all of those things, then all of the the burnout, the exhaustion, the extra administrative stuff, that extra hours, all that is just going to become intolerable, and you’re going to end up leaving. [33;51] – (about coaching and Dr. Atul Gawande’s acceptance of coaching) But I think it kind of goes back to the culture of medicine and the inability to ask for help, or to be seen as weak or to be seen as not knowing it all. 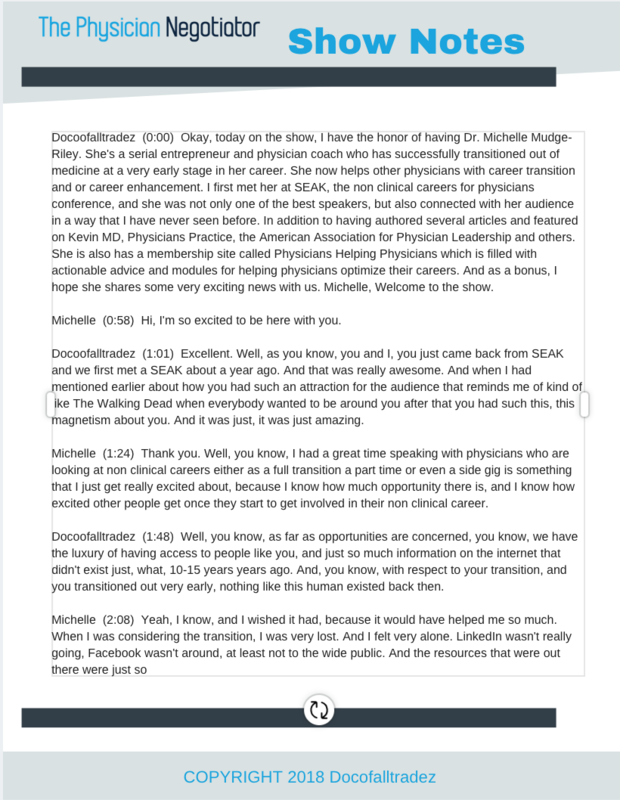 [36:32] – Physician Helping Physicians Celebration Conference… we’re going to be mentoring like crazy. There are going to be some workshops and sessions because I want people to get value out of this. And I will personally guarantee that everyone who comes has an updated resume an elevator pitch when they leave. Now the really cool thing about this is the way that I am structuring the registration for it’s going to be a donation. Subscribe Now and get every episode of the physician negotiator in your inbox!